FILE - A partially damaged billboard with a portrait of Russian President Vladimir Putin is seen on a roadside near Simferopol, in Russia-annexed Crimea, Jan. 24, 2016. The billboard reads: "Crimea. Russia. Forever." Russian opposition leader Alexei Navalny says President Vladimir Putin's decision to annex Crimea, which occurred five years ago this week, has come at a significant financial cost to Russian citizens and a large political cost to the president himself. "Putin, in order to strengthen his personal power, sacrificed the interests of a huge number of people," Navalny recently told VOA's Russian Service, citing data from Russia's Economic Development Ministry that show real disposable incomes sliding for the sixth year in a row. Russia invaded Crimea and annexed the Black Sea peninsula from Ukraine in 2014, following street protests in Kyiv that resulted in the ouster of pro-Russian Ukrainian president Viktor Yanukovych. It marked the first forcible seizure of territory in Europe since World War II and triggered multiple rounds of U.S.- and EU-led sanctions that have since wreaked havoc on Russia's economy. FILE - Russian opposition leader Alexei Navalny is seen at his office in Moscow, March 18, 2018. On March 18, 2014, the day Crimea was formally incorporated into the Russian Federation, Putin declared in a Kremlin speech: “Crimea has always been an integral part of Russia in the hearts and minds of people." The strategically important peninsula had been Russian territory until it was ceded to the then Soviet republic of Ukraine by Soviet leader Nikita Khrushchev in 1954. Polling in 2015 by the private Moscow-based Levada Center shows the annexation of Crimea helped Putin recover from sagging approval ratings. For months after the annexation, Putin enjoyed a record-high approval of nearly 90 percent. "For some time, [Putin] strengthened the rating of his personal power, but the country paid a rather high fee for it, because he completely curtailed all domestic policy in favor of foreign policy adventures, which began in 2014 and so far haven't ended," said Navalny, referring to Russian military activities around Crimea, along the border of Ukraine's eastern Donbas region, and on the ground in Syria and Africa. FILE - An image grab taken from AFP-TV shows Russian army vehicles on patrol in the area of Arimah, just west of Manbij, Syria, Jan. 17, 2019. Beyond conventional military commitments, recent reports also show Russia has expanded its portfolio of military training and commercial engagement, including arms sales, across the African continent. Last fall, Reuters reported that Yevgeny Shabayev, head of a chapter of a paramilitary Cossack organization with ties to Russian security contractors, said there could be as many as 1,000 armed Russians based in Central African Republic alone. One Russian private military contractor, the Wagner group, was thrust into the spotlight last summer when three Russian journalists were killed while investigating allegations of Wagner's presence there. Shabayev said anywhere from 5,000 to 10,000 Russian paramilitary operatives are present across Africa, including in Sudan, South Sudan and Libya. "That is, the Russian authorities and Putin are personally engaged in everything with the exception, strictly speaking, of the Russian Federation," Navalny said. He added that the Kremlin's neglect of domestic problems explains Putin's record-low approval ratings, which have been dropping consistently since his 2018 reelection. Although Putin used his annual State of the Nation address in late February to vow increased social spending and popular handouts in a bid to salve popular resentment over falling living standards, Navalny said the gesture may be too little too late. In recent travels throughout Russia, Navalny said he saw an unusually diverse range of citizens expressing frustration with Putin - even in third-tier cities and rural enclaves that have historically been pro-Kremlin strongholds. 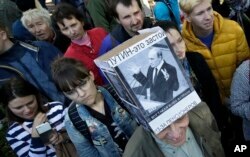 FILE - A protester wearing a hat depicting Russian President Vladimir Putin and reading 'Putin equals stagnation' is seen during a protest rally against a planned retirement age hike, in St. Petersburg, Russia, Sept. 16, 2018. "In general, I didn’t have any illusions like the fact that the oppositionists are only some rich hipsters with cups of coffee," he said, referring to Russia's affluent urban centers such as Moscow and St. Petersburg, which tend to attract the majority of publicly vocal opposition activists. "But all these trips and conversations with people just once again proved to me that opposition supporters are poor people ... normal people who do not have the slightest prospects," regardless of where they live and work, he said. 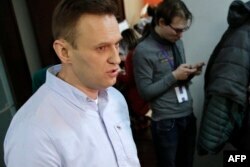 Navalny, who mounted a grassroots presidential campaign before he was officially barred from running in the 2018 election, said rather than continuing to seek office himself, he has instead chosen to focus on a "demonopolization" of the political power that Putin's United Russia party has over the electorate. Called "smart voting," the campaign to loosen United Russia's grip on power will involve supporting virtually any political minority candidate who appears to have a chance at unseating a United Russia politician. "We're generally not allowed to participate in the elections, but, nevertheless, we want to participate in such a way as to cause maximum political damage to United Russia, even by voting for people who are not close to us, and sometimes even nasty," he said. The next round of regional legislative elections are scheduled for this fall. This story originated in VOA's Russian Service. Pete Cobus contributed reporting.